Property development is a fundamental part of economic growth. However, with finite available space, developers and funders are increasingly being required to contribute to the environmental safeguarding of greenfield land by developing brownfield sites. While reinvestment in existing property can minimise the need to develop new buildings, aged and underperforming stock can be expensive to manage, operate, let out or divest. To ensure the redevelopment of brownfield sites is as profitable as possible, Paragon’s director of environmental and sustainability, Charlie Knox, has looked at some of the myths surrounding sustainable development and the importance of underpinning investment by taking a sustainable approach to the redevelopment process. Let’s start with what sustainability really relates to in the world of real estate investment and development. In its simplest form, it can be defined as the relationship between socio-economics and the environment – this underpins the concept of sustainability. Social and economic growth within the built environment will not be achieved on a longer-term basis if environmental issues are not appropriately addressed, as social and economic growth relies on the wider environmental system to exist. In other words, environmental awareness is essential to what we do as property professionals and environmental issues can impact businesses of any size or type. As such, all parties involved with developing and acquiring sites must participate in strategic environmental and sustainable thinking in order to maximise successful development and investment outcomes. More than ever, there is an emphasis on the built environment, which goes beyond simply thinking about bricks and mortar. It’s about creating safe, clean, interesting spaces that people want to work, live and travel within, and that they enjoy. Sustainability is at the heart of the built environment and the property industry has the power within its hands to shape social and economic growth whilst minimising environmental impacts – and there’s plenty of incentive to do so. Increasingly, sustainability credentials sit alongside location, rental value and building type in equal measure when determining the future value of property. Consequently, more sustainable buildings are attracting increased investment and are providing longer-term investment return. For example, installing photovoltaic solar panels to an asset may add capital value. Operationally, I am finding that tenants want to operate from better buildings, which are shown to increase productivity. In order to create places for people to work and live, we have to redevelop and regenerate sites that have been previously developed upon. But, as the old saying goes, don’t judge a book by its cover. Brownfield sites may have had a series of uses over their lifetime, and thorough land contamination investigations can identify pollution issues even from historical sources. These can include hazardous substances such as the presence of asbestos, contamination from previously existing underground fuel tanks, and plumes of solvents in groundwater – all of which are live examples from recently undertaken investigations of seemingly innocuous properties. It’s important that environmental risks from contaminated sites are evaluated early on to safely construct property on previously developed land, or redevelop existing stock, in order to safeguard the wellbeing of the site users. Similarly, it’s critical that new and existing stock is designed and managed to mitigate impacts to the wider environment. Property developers and real estate funds should embed a coherent environmental assessment strategy within their investment approach because of the potential environmental liabilities that can arise. Completing environmental assessments and investigations in the short term will lead to cost and time savings in the long term and future proof your investments. Feasibility assessments of investment in standing assets and forward funded schemes should include, where possible, an appraisal of land contamination, flood risk, ground stability, energy performance, waste management and health and wellbeing considerations. Stakeholder engagement between funders, developers, regulators and end users is essential in the successful delivery of a sustainable development. Sustainability credentials should be monitored throughout the life-cycle of an asset from site selection and conceptual design, to detailed design and construction through to eventual operation and asset management. This will ensure that investments provide long term, robust returns with minimal environmental liability. In a time of political and economic uncertainty, it is understandable that those involved in development focus on the bottom line and there may be a temptation to downplay environmental issues. However, in my experience, funders are increasingly frustrated by an emphasis on growth at all costs and few condone disregard for the environment or the wellbeing of future generations. Therefore, better environmental standards and leadership in environmental protection and sustainability will stand property investors and developers out from the crowd and attract more inward investment. We are working with funds and investors who are committed to assessing sustainability credentials as part of their real estate portfolios, in line with their Environmental Social Governance (ESG) policies. This approach is being achieved in many ways, such as incorporating environmental compliance auditing into asset management plans and encouraging an environmental dialogue between landlords and occupiers. Clients are also undertaking periodic assessments of sustainability targets at the planning, construction and completion stages of development in order to monitor and evaluate projects against environmental benchmarks. The most advanced are setting targets beyond statutory requirements. These leaders within the industry understand the positive impact sustainable development and investment can have on their returns and the environment. As more businesses are prepared to accept environmental responsibility within our industry, there will be an increase in sustainable property investment and development that achieves socio-economic growth within the UK without negatively impacting the wider environment, which ultimately, we will all benefit from. 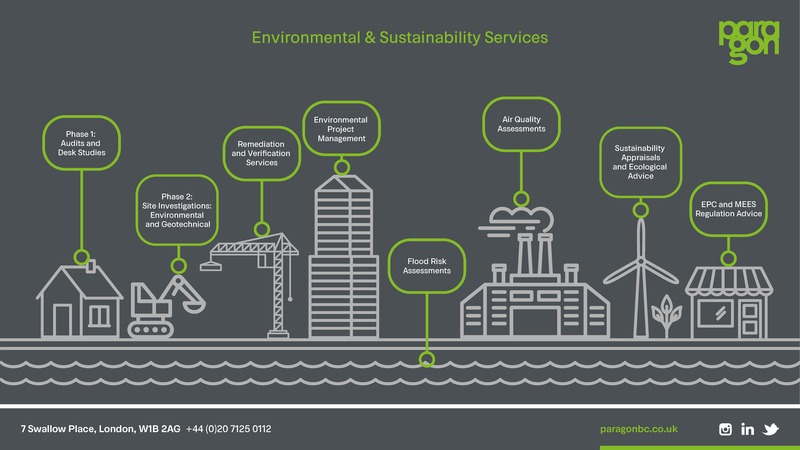 Find out more about Paragon’s environmental and sustainability services.